The Hoxton, a posh hoity-toity club venue, seemed an odd fit for Bay area garage rock king Ty Segall, but the kids in the crowd couldn’t care less. In fact, the juxtaposition of the venue and the search-and-destroy attitude of the crowd was brilliant. His just-under-an-hour-long set, aimed to destroy with a slew of tracks from his latest Black Sabbath-esque release Slaughterhouse, had the crowd hopping, bopping, pushing and shoving. It was an endless stream of crowd surfing and stage diving: bodies everywhere, limbs flailing. Distortion, feedback loops and screeching guitars abound, the crowd was displaying just as much energy as the band was dishing out onstage. Segall’s vocals, ranging from screams, shrill shrieks and low elongated moans to sweet sounding “oohs,” rounded out this high-energy affair. The band powered through with tracks like the infectiously melodic “Tell Me What’s Inside Your Heart” and equally catchy “Muscle Man.” Segall made sure to throw in older classics like the always well-received sing-along “Girlfriend” and “Finger” from his 2009 release Melted. The intensity didn’t let up, offering not a moment’s peace, which pleased everyone in attendance. The night ended on an awkward note, however. During his set-closing “Wave Goodbye” (how terribly appropriate), the bouncer began angrily pushing the happy-go-lucky stage divers off the stage. Ty, visibly upset at this, intervened and attempted to push said bouncer into the crowd himself. A kerfuffle followed, abruptly ending the set on awfully awkward terms. Despite this, Segall and co. gave a killer set, heavier and far more raw than his last visit to the Horseshoe back in May. 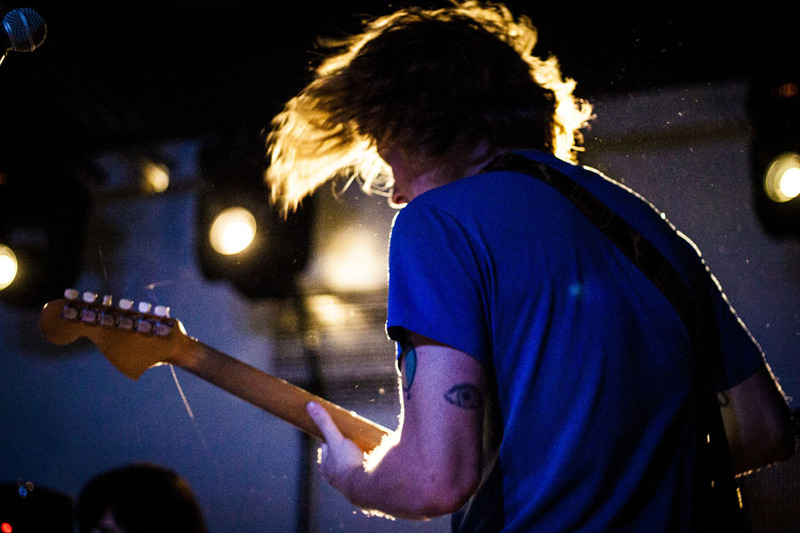 Co-headliners Thee Oh Sees upped the ante with their equally explosive set. The crowd grew even more enthusiastic as far as stage diving and crowd surfing are concerned. One girl, completely caught in the moment, climbed onstage next to lead vocalist John Dwyer and proceeded to bow to the band, blowing kisses and dancing like no one was watching (although that kind of thing is hard to ignore). Dwyer is an absolute madman; looking bonkers as he deep throats the microphone, widens his eyes and sticks out his tongue like a Maori warrior. Their set was on a constant go-go-go, stretching out tracks like the initially 3 minute long “Dead Energy” for ten minutes of instrumental madness. Conclusion: these San Francisco maniacs know how to cater to crazy kids. Wild.